Many people have become aware of the existence of bed bugs as tales of itchy horror spread from one household to another. Yet, little information has been provided to the general public about these small dwellers in our mattresses, couches and other household items. Bed bugs are the common name for Cimex lecutralus. This species is parasitic in nature and primarily feed on the blood drawn from warm-blooded animals such as humans, bats, pets, birds and even rodents. They are minuscule in size and grow to about 5 to 7 mm upon adulthood. Male bed bugs are differentiated from the female through their pointed abdomen tips, whereas females have a more rounded tip. Bodies of the bed bugs are flat and thin to allow ease in concealing themselves in any surface such as box springs, luggage, linens and others. They can also crawl and hide in between floorboards, frames, household decorations and voids on the wall. Bed bugs often hide in secluded areas during daytime and crawl out at night to feed on an unsuspecting host. After a blood meal, their bodies will bloat and will appear as reddish-brown in colour due to the engorged blood. What sets bed bugs apart from mosquitoes and other parasitic insects is that bed bugs will always prey on blood starting from the immature stage until they reach adulthood. Both male and female bed bugs consume blood in order to mate, reproduce and lay eggs. Their blood meals may vary. It can be as short as 3 minutes or as long as 15 minutes. In cases where no host is present, bed bugs can still live for many months with no engorged blood. Though they cannot fly, they can efficiently travel a good 5 to 20 feet in order to search and feed. 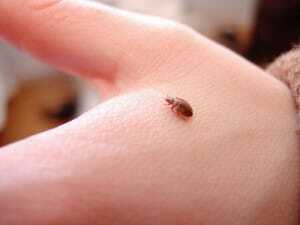 Bed bug bites are painless, though they will result in irritating and itchy welts. Any blood loss from the feeding normally does not affect the human host. However, some people may exhibit irregular responses such as insomnia and stress due to bed bug bites.